Much has changed in our state association in the last few years due to consequences of the restructure process with AAMFT, threats to the profession, and a host of other factors. This is a critical time in our association's history, and your attendance and voice are needed at this special event. 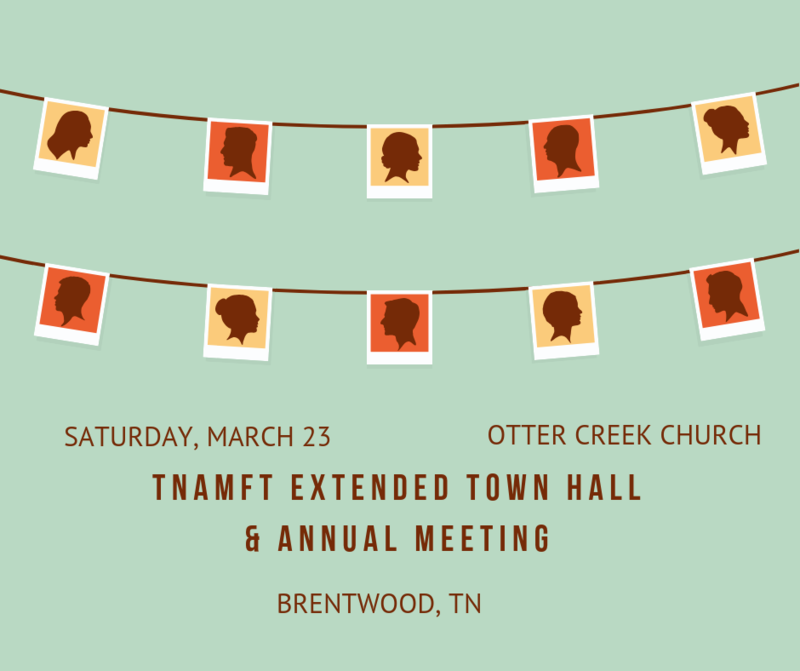 TNAMFT will present an Extended Town Hall Meeting in middle Tennessee - hosted by Otter Creek Church, 409 Franklin Road, Brentwood, TN. This Extended Town Hall meeting is from 9:00 am - 3:00 pm and will offer you a free light breakfast, free CE hours, and networking opportunities. Doors will open at 8:30 am. The agenda for the Extended Town Hall meeting will include annual reports from the TNAMFT Board members, Advocacy Update, Membership Update, and Proposed Bylaws Changes with periods of open discussion woven throughout the agenda. No vote will be taken on the proposed TNAMFT Bylaws at this meeting, but attendees will be the first hear a report on the proposed changes from Director Barry Greenlee. The event is free, and lunch is on your own. Registration preferred. Click above at the tab on your left to register. Please make every effort to attend! This event follows a regional workshop in Middle Tennessee and was coupled with this Extended Town Hall event in lieu of an annual conference. Click on the Calendar Event on this website for the Friday, March 22 Middle Tennessee Workshop at Belmont University for more information. Additional free regional workshops will take place in East and West Tennessee later this year. Details will be announced at the Town Hall.